I have a new obsession with alcohol ink. I’ve been playing around on Yupo paper with various inks. I share photos of those pieces on my personal instagram from time to time, if you want to check them out. Today, I just wanted to share a quick and easy alcohol ink DIY project. It’s sooo simple! 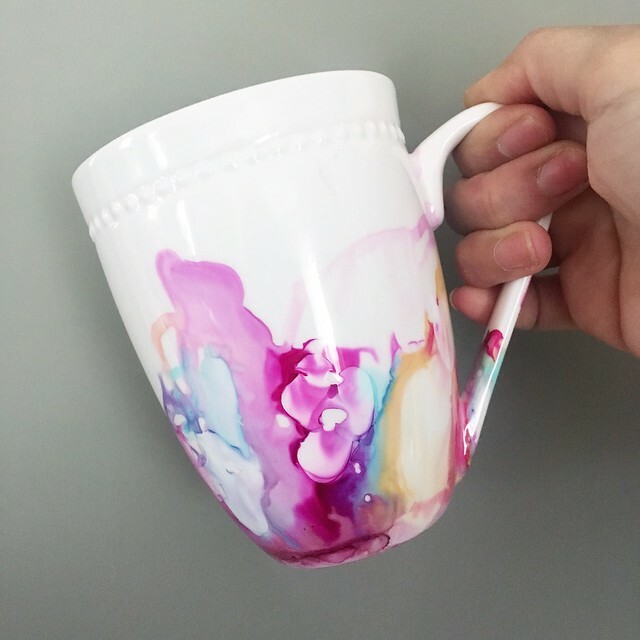 All you need is a glazed ceramic or porcelain mug, paintbrush, alcohol inks, a straw (optional), 99% isopropyl alcohol and an oven. Maybe gloves, too. This can get messy. I bought a white ceramic mug for $2.99 at HomeGoods. I then started dropping my colors on, randomly. I used colors from this Lakeshore set and this Nature Walk set of alcohol inks. I swirled the mug around here and there to let the colors run *sort of* where I wanted them to. You really just have to give up a bit of control when it comes to alcohol ink! I used a straw every once in a while to push some ink around even more by blowing air through the straw onto the wet ink. When I was happy with the results, and after I was sure all the ink was dry, I put the mug into my oven at 300 degrees for 30 minutes to set the ink. I’ve also read that you can cure your mug (or plate, or bowl?!) with a layer of dishwasher safe Modge Podge, but I haven’t tried that. Voila! I’m pretty much ready to alcohol-ink anything ceramic at this point. So much fun! Thanks! I had fun making it! Awesome! I won some alcohol inks a few years ago and they have languished in my cupboard for a while because I didn’t really know what to do with them. Love this idea. Thanks! Yes, try this out! Haha I’m glad you found me! I’ve only juse recently gotten into alcohol inks, so you will mostly find card making posts on the blog. Recently I’ve started sharing some of my soapmaking, too. I’ll definitely be sharing more alcohol ink projects in the future! Hi Libby! I would stick to careful hand washing for any of this kind of stuff. I’ve made a few mugs and still haven’t settled on a fail-proof method other than just being careful when washing. I’d also recommend not letting them soak in water.